Fabulous sighting of Team Candyfoxybelle in the middle of nowhere – thanks to Nell Hall, who was passing on her bike, for the photo. 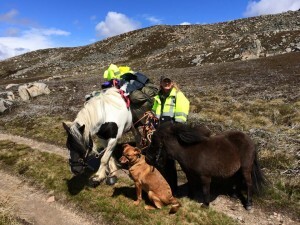 Despite the misleadingly blue skies it is very cold and windy and the adventurers put in an extra long day to reach a sheltered spot just north of Braemar to sit out the expected storm and get some well earned rest, recuperation and resupply. What a gutsy performance from them all especially after Tuesday. They are all tired but confidence has returned. Go team CandyFoxBelle! Out of the way EGS!